If Prince’s new tweeting reality is any indication, the Purple One has entered the comically self-aware portion of his career. 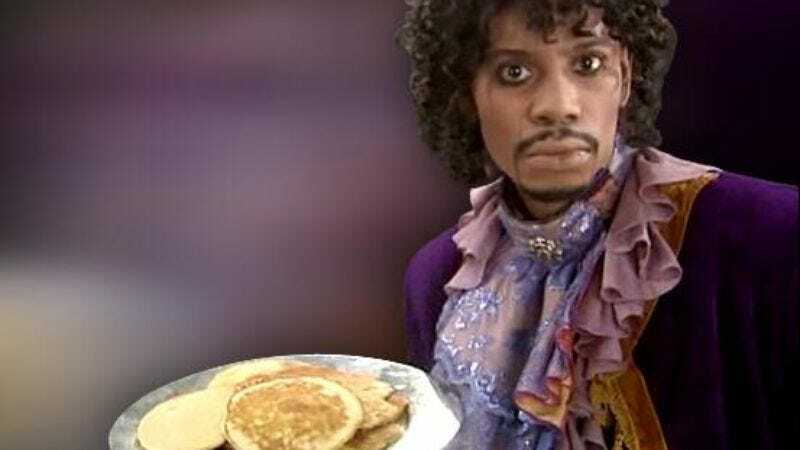 Last week he kicked off his Twitter stint with a “selfie” picture of some mysterious smoke, and over the weekend he posted a snippet of a sultry new single, “Breakfast Can Wait,” and linked to the video by tweeting simply, “Game: Blouses.” That’s a Chappelle's Show reference, for anyone not in the know, and the single’s artwork spells that out with an image featuring not Prince, but Chappelle dressed as Prince, complete with a plate of delicious-looking pancakes. Put on your own ruffled outfit, grab a basketball, and listen to a snippet of the track below.